We are puzzled. First of all, there are no farming plots to be seen here, in sandy Nkwen just outside Bamenda, the capital of Cameroon’s North West region. Just like there are also no traces of trees, or even of damage to trees. Did people questing for firewood raze the area so completely, roots and all? But Patience Ndifor ignores our question, says: “We are trying to replant them at present,” then ends the interview. When contacted by phone, a spokesman at the palace of the traditional leader of Nkwen confirms that trees were indeed planted and what is more, that they are even still there. “It was very hot lately so some died. But about a thousand survived,” he says. When we tell him that we are right there, in Nkwen, looking at no trees at all, he, too, hangs up the phone. We had, likewise, not been able to find a culvert that the NGO SAILD (Societe pour l’Aide des Initiatives Locales de Développement), said it had constructed in the Mankon area with funding from the European Commission as well as from SOS FAIM. The culvert was purported to link the farmers alongside the Mezam river to the markets in Bamenda town, which was, a farmer in Mankon had told us, a very good idea. “Selling our goods in town would give us access to money.” (He had previously told us that nobody had any actual money in the area, “you won’t even see an FCA 1000, US$ 2, note. If you’d wave that around people would get angry with you for flaunting so much wealth.”) But that there was a culvert supposedly there already had been news to him. SIRDEP and SAILD are not large scale projects, but each do purport to be engaged in poverty alleviation in this region, which has been all but abandoned by the government in the south. The North West, with its reputation for anglophone rebelliousness vis a vis the francophone southern governing elite, receives much less state budget than other provinces in the country: less than half per capita compared to the spending in the centre and south (1). Because of its dismal poverty and the neglect of the state to provide even the most basic services, donors and projects have flocked to this province to fill the gap. Which is why we had decided to check the NGO projects on the list we have obtained from the ministry Ministry of Territorial Administration and Decentralisation (MINTAD) (2), to see if and to what extent these manage to do so. But wherever we go, results largely remain invisible. Of the six water wells that the World Bank had presented in a glossy report (3) as satisfactorily completed in 2012 there were now, five years later, only two of such wells, and only one of these yielded any water. (Warned by a sign that said ‘water not allowed for drinking,’ we had shied away from tasting it.) Neither had we seen the handy new long and wide roads that the World Bank said had been constructed to assist the locals people with transport for their agricultural trade. There were some pieces of road, which had been new five years ago, but were now narrowed and dilapidated. Remarkably, by his own admission, municipal head Augustine Fortisah Che in Bamenda’s Atuazire area, has signed for delivery of the six World Bank-funded water wells in his area in 2009, even though he had only ever seen four wells and two of these had already been broken at the time. “That’s because I can’t read French,” Fortisah Che explains. The World Bank monitoring delegation had come from the francophone capital Yaounde and the document had indeed been in French. But we can’t shake the nagging suspicion that both Fortisah Che and the Nkwen traditional authority spokesman who confirmed to seeing a thousand trees when there were none, may have received an ‘enticement’ in exchange for their signatures. According to several academics and legal professionals we speak to, this is common practice in ‘development aid monitoring’ in Cameroon. 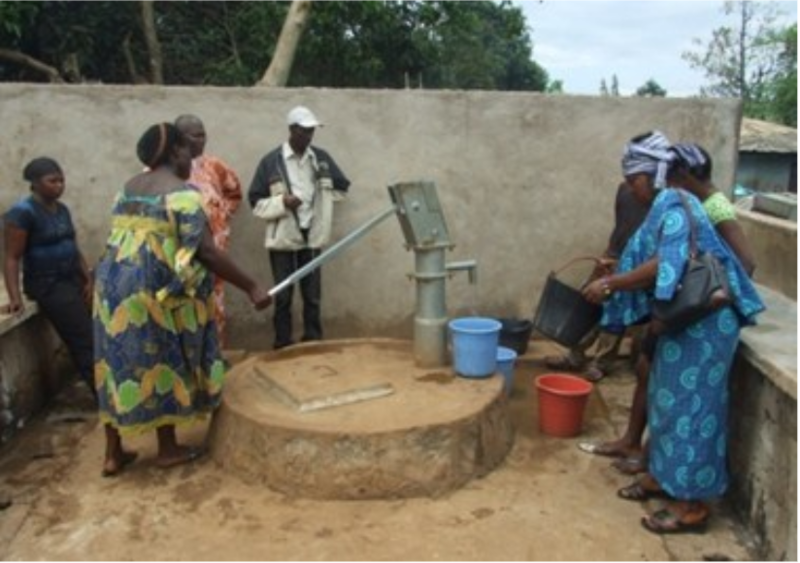 The Water Well according to the World Bank in Cameroon. Trying to find projects that had, in fact, done anything at all for the people in and around Bamenda, with its over forty donor-funded NGO programmes, we had ended up finding only two that could be said to be remotely beneficial. One sold local crafts to tourists; the other gave money and cattle straight to farmers. But other projects, like the ones that were said to be for the disabled were unknown even to families with disabled family members who lived nearby. A project for epilepsy sufferers was located so far up a muddy hill that we could not access it. Lifidep’s coordinator, Pius Mbipe, does pick up his mobile, but sounds greatly disconcerted when told that there is a journalist on the other side. “What the results of Lifidep are,” Mbipe’s voice sounds, confused. “What do you mean? We don’t give information.” We say something about public interest and the role of the press. “Yes, yes, the press, of course,” Mbipe says. “But we can’t give information on the phone.” Can we then have an email address? There is a silence. Then: “No, sorry, sorry.” And the phone cuts. It doesn’t get better. When we phone the SAILD office to enquire about the culvert project and how much money had been spent on it, a male voice tells us that ‘costs of culverts are determined by their dimensions.” Explaining that we are talking about the Mankon culvert, and that the culvert in question isn’t actually there, the voice repeats: “it depends on the dimensions,” and the phone is cut. Two emails to SAILD’s funders, SOS Faim in Luxemburg and the European Commission in Cameroon, yield no response. A local who lives in a nearby rural area where a water project was planned, but never happened, also refuses to talk to us. “I am not going to complain about (the people in charge of that project.) They can kill my children with witchcraft,”, he says before he walks away. And maybe there is witchcraft at play. The two companies that had been contracted to carry out the projects for the World Bank, Bright GP and the Joe Corner Water Company, don’t even seem to exist. 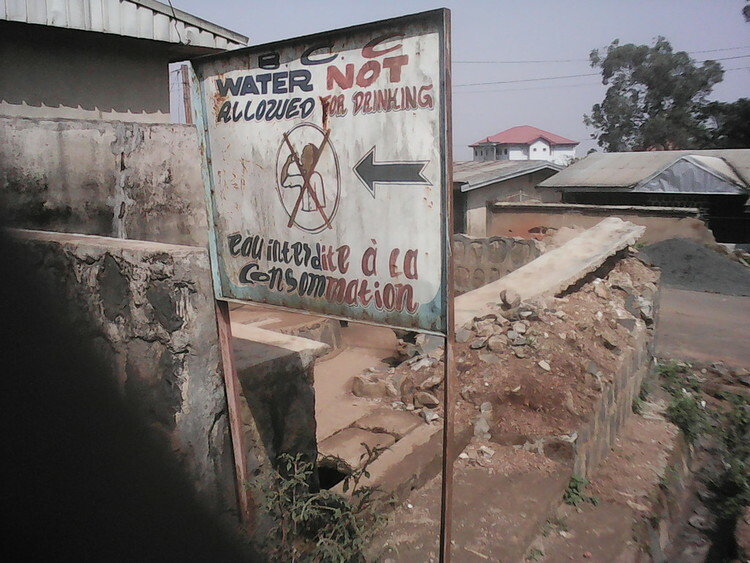 According to its address on a Cameroonian commercial business website, the Joe Conner Water Company that built the stretches of road for the World Bank, resides at Nkwen street in Bamenda. But Nkwen street is very long, and there is no house or plot number. The email address doesn’t respond and neither does the phone, which we ring every day for a number of days. 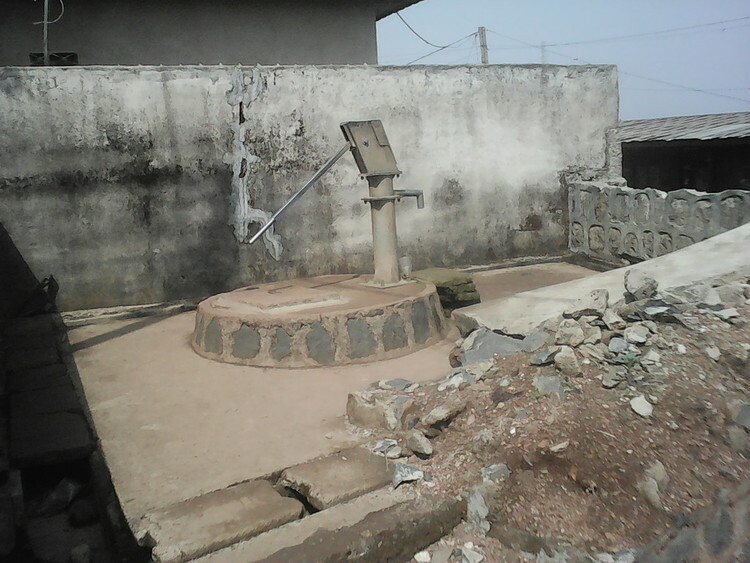 The company Bright GP, which, according to a document shown to us by the municipal head of Atuazire Quarter, had built the World Bank’s water wells, is equally untraceable and the two government ministries based in the capital Yaoundé that Bright GP had done business with, or for, were inaccessible, with the one website giving an ‘error’ message and the other a virus alert. The World Bank doesn’t help. “As far as the World Bank is concerned, all information that can be disclosed would be in the (World Bank) website. For all other technical or legal aspects, some of your questions are non-disclosing elements that cannot be shared with the public. 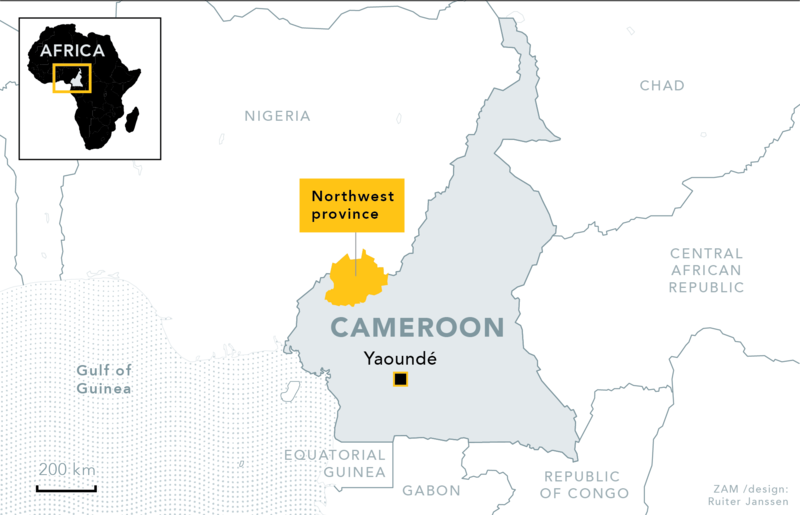 As for all other related queries, you should refer to the ministry of Economy, Planning and Regional Development as they represent the Cameroonian government and the Maître d’oeuvre for the projects in Cameroon,” reads the email we receive from Odilia Hebga at the World Bank Office in Yaoundé. We try the Ministry of Economy, Planning and Regional Development, also in the capital, again, but the website is still out of action and the phone just rings. “You’ll find the same people behind these NGO contractors and projects,” a local auditor tells us. “It’s government officials.” He gives examples of payments made to state officials ‘and their relatives’ from the projects he audits . Asked whether he queries these, he says no. “They always get a clean audit. Otherwise one is in trouble.” That evening, we receive a phone call from the young auditor, in tears, with his mother next to him. She is crying too. If we can please, please, please not reveal his name, they ask. It is perhaps the greatest paradox of this story that in this neglected, feared anglophone and rebellious part of Cameroon, where many look for help from NGO’s, these very NGO’s are again appropriated by state officials, -and officials of the hated Biya regime in Yaoundé at that. Government delegate Vincent Ndumu of Bamenda, for example, a Biya loyalist, who, according to a local news article, owns the company that puts up the market stalls for farmers in town and thus collects the punishingly high rents that he -as boss of the city- forces farmers to pay for these (4), was the ‘partner’ of a ‘Twinning with Bamenda’ project established by the well-meaning citizens of the Dutch town of Dordrecht for years (5). But all that was already in the making when the government, in 1999, crafted a degree that would turn the NGO sector so opaque that it would become very easy for the elite government to get its hands on development aid funding from abroad. Decree No.99/014 of December 22, 1999, came at a time when funding through NGOs had become a channel through which well-meaning donors attempted to avoid embezzlement of their moneys by those in power. Much aid was increasingly starting to get channeled directly from charity-in-the West to community-based non-governmental entities in Cameroon. Decree 99/014 countered this development by allowing private ownership of NGOs without any rules for accountability or transparency with regard to received funding. This, says sociologist Eric Kombey, who has done a lot of consultancy work for government, enabled officials to “still dip their beaks” into foreign aid streams and benefited “the same authorities and individuals who had (previously) mismanaged allocations by donors to the government.” A legal expert who also works for the government confirmed that in his experience, too, many NGOs seem to be “an emanation of government functionaries who use them to siphon money into their personal pockets.” When the government, in 2009, allocated about US$ 3,6 million state money (with the state budget still also assisted by foreign donors, who regularly earmark part of their funding as destined for ‘non state actors’) for distribution to NGOs, the entire sector only knew about it in 2011 and not one NGO interviewed for this report would admit to having received any part of this money. There is a technical commission that should supervise the NGO sector. But eighteen years after the signing of the NGO decree that instituted it, nobody knows whether the commission has been constituted, who the members are or whether it has ever met. Officials in the Ministry of Territorial Administration and Decentralisation (MINTAD), under which the NGOs fall, tend to respond angrily when questioned. “There is a palpable embargo on information about any such (new) budgetary allocations to the NGO sector (now),” revealed one MINTAD official who requested anonymity. According to the Cameroon Bureau of Statistics, people in North West in 2014 were poorer than they had been in 2001 (6).